Omega Blogger – All About Omega Watches » Planet Ocean Chronograph – Sneak Preview? Planet Ocean Chronograph – Sneak Preview? 26 October 2005 – What better way to celebrate ten years of partnership than to continue such a successful working relationship? Omega is pleased to announce the extension of its agreement with Michael Schumacher as an international ambassador for the brand. The seven-times Formula 1 World Champion and passionate watch collector is one of the longest serving Omega ambassadors and has already added a special touch to numerous international events organised by Omega. Well its news but not exactly earth moving. 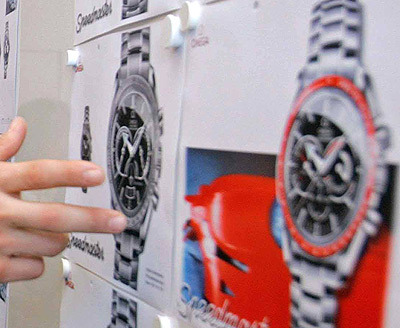 What is more interesting is that photographers were on hand to record Schumacher’s visit to Omega Bienne and inadvertently revealed what looks at first glance to be plans for a possible Planet Ocean Chronograph. On the other hand it is just as likely to be another Speedmaster version, this one with an Orange bezel and a hat tip to the 1950’s [the “Speedmaster” on the drawings may or may not be a clue :)]. This entry was posted on Monday, November 28th, 2005 at 7:22 pm	and is filed under Omega Seamaster.